Running in Bermuda. 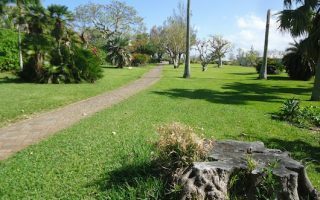 Best routes and places to run in Bermuda. Bermuda is a British Island territory in the North Atlantic Ocean, known for its pink sands beaches and unique blend of British and American culture. It’s a popular tourist destination, given close proximity to major U.S. east coast cities, good weather, turquoise waters, and lush tropical foliage. Running in Bermuda requires choosing your spots. There are beautiful beaches and tempting running roads with great views, but many of the roads are very narrow and do not have good shoulders or sidewalks. This guide will help you choose the best and safest spaces for a run! Our special thanks to Sharon Fenn at Sportseller for her valuable insight. 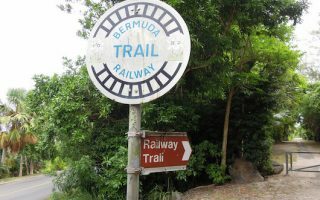 The best off-road running in Bermuda is along the 26-mile Bermuda Railway Trail, especially along the north shore and the west end in Somerset. We love the area between Horseshoe Bay and Elbow Beach, with features a combination of good running beaches, sandy dune paths, and view from runnable South Rd. St. George offers some wonderful, quieter roads for running, and a nice section of the Railway Trail out to Ferry Reach Park, which itself features lovely running trails. 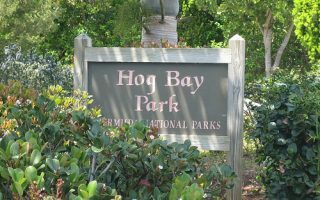 Other good off-road options include trails in Hog Bay Park, the Botanical Gardens, the Arboretum, and South Shore Park. The best beaches for running are Horseshoe Bay, Elbow Beach, and Shelly Bay Beach. Getting around Bermuda is pretty easy. Many visitors have cars or rent scooters. A good bus system provides access to most of our favorite running spots. 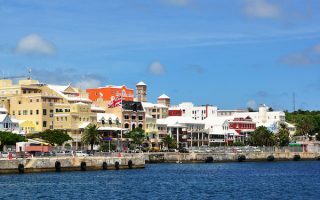 There's terrific running in Bermuda's small capital. Our 4.6 mile 'runseeing' tour features waterfront running along Front St., pleasant side streets with colonial era buildings, several small parks, and a jaunt up to historic Fort Hamilton. 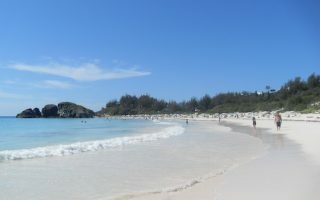 Great running on Bermuda's South Shore, in the 3.5 mile stretch between Horseshoe Bay Beach and Elbow Beach. Run on the beach, on sand dune paths, or along South Rd., which has a decent shoulder in this section. 26-mile Railway Trail covering nearly the entire island west-east is the best opportunity for a longer off-road run. Combination of surfaces and there are some breaks. Prettiest section is the north shore. See separate post for section descriptions. There are three particularly wonderful sections of this 26-mile island wide rail trail: St. George's, the North Shore, and the western section between Vesey Nature Reserve and Somerset Village. We've mapped them out, with descriptions. 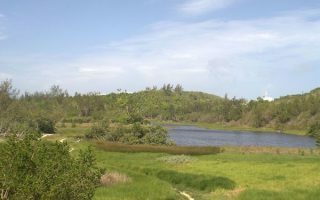 This island in the northeastern part of Bermuda has some lovely running options: Quiet, waterside roads around the airport, the Railway Trail from the Town to Ferry Island Fort, scenic Barry Rd., and 2 miles of trails in Ferry Reach Park. A lovely spot for running, 1 mile from Hamilton. About 1 mile of interlocking paths around gorgeous flowers, palm garden, a subtropical fruit garden, & greenhouses. Free. Can combine with Hamilton, Arboretum, running track in Sports Complex. Popular spot for runners in Sandy's Parish. Pleasant network dirt/sand trails, ~ 1 mile of running, fairly wooded & hilly. Cool off with a swim at Hog Bay Beach! For a longer run, the Railway Trail is just off Middle Rd. at the eastern edge of the park. 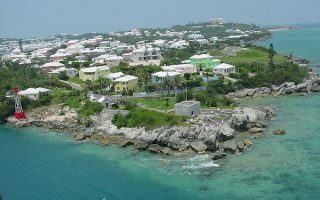 Bermuda has a humid subtropical climate. Winters are mild, with good recreational weather if not beach weather, with average high temperatures from December-March around 70F (21C) and nights around 60F (16C). Spring and fall are warmer. Summers are warm and humid, with average high temperatures around in the mid 80s (28-29C) and nights that don’t go much below the mid-70s (24C). Runners should take the right precautions in summer. Rain is fairly spread throughout the season, but more through thunderstorms in summer. 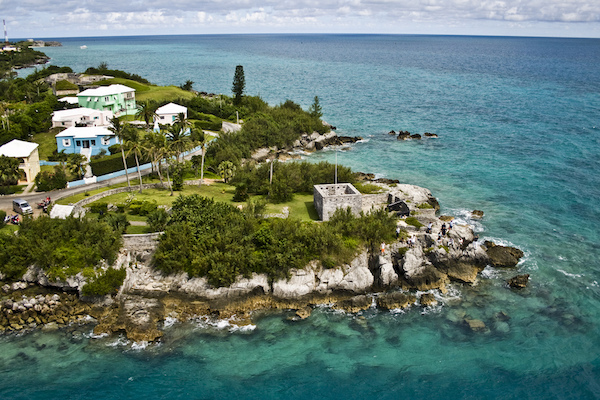 Most of Bermuda’s relatively few hotels are located on the south shore of the island. Sportseller is a wonderful sporting goods store centrally located in Hamilton and the best place on Bermuda to buy running gear. 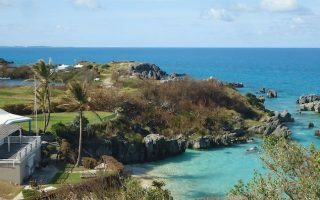 We thank Sharon Fenn for her great insight on the best places to run in Bermuda! The Mid Atlantic Athletic Club is a great resource in Bermuda for training programs, event, and group runs. International Race Weekend, a three-day celebration of distance running that begins with a series of road miles on Friday night and culminates with a Sunday-morning marathon and half marathon. Mid-January.